My 2nd locomotive here. The last for now. Time for some roadgoing stuff again. The German Class 41 steam locomotives were standard train engines operated by the Deutsche Reichsbahn (DRB) and built from 1937–1941. They were primarely designed to haul freight. A lot of the freight consisted of cattle, and therefore it had the nickname: Ochsenlok (cattle locomotive). A total of 366 were built by a number of manufacturers according to standardized specification. The one I built is nr. 41-241. It was manufactured by Borsig (AEG) from Hennigsdorf, Germany. It is now in possesion of the Dutch VSM and currently converted from an oil rebuilt back to coal again. This particular engine is called “Polarstern” as it crossed the polarcircle on a trip in Norway during the nineties. The engine is 23,905 mm (78 ft 5 in) in length (including tender). It has a service weight of just over 101 tons. The power is around 1870 hp, capable of bringing the engine upto 90 km/h (56 mph) topspeed. 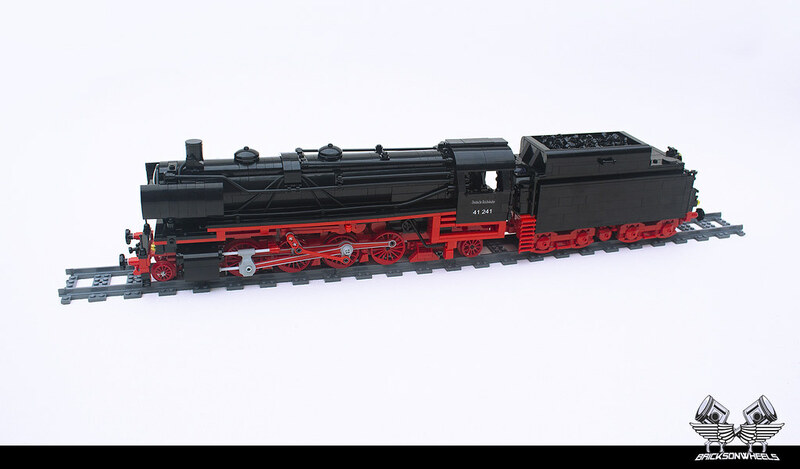 My Lego version is scaled 1:38 to correct Lego gauge. 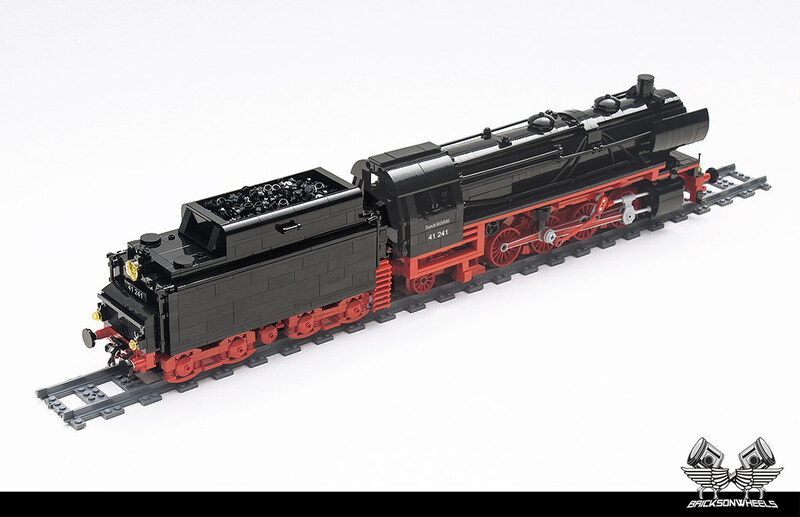 It is powered by two PF XL engines, and can be controlled by Lego’s PF IR Speed Remote Control Unit. 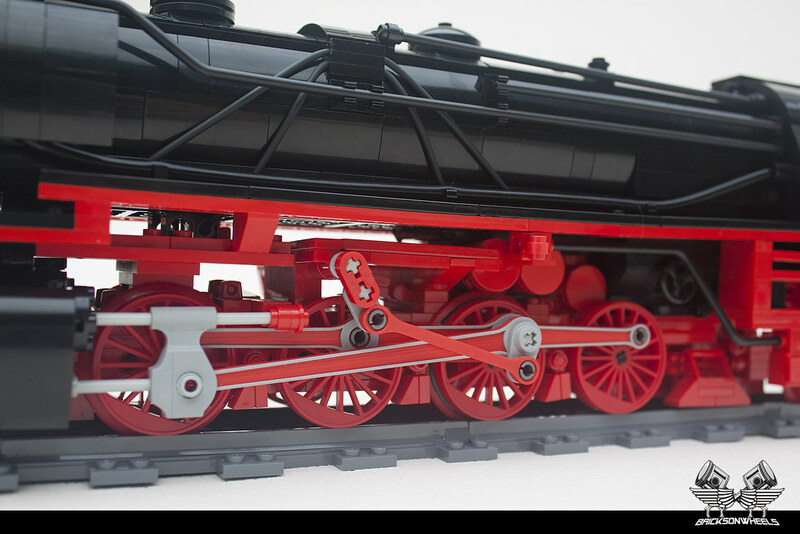 Its all genuine Lego,except the valvetrain and wheels. The valvetrain is designed by myself and Jaap Kroon (http://www.jaaptechnic.com/), who 3D printed them in marvelous red and grey for me. This engine will be on display in October at the Legoworld event in Utrecht, Netherlands, and will be riding together with the UP Big Boy. Amazing build, so many details! I'm definitely going to watch it in Utrecht in October. Outstanding! With all the great detail work on this, it is hard to choose what I like the most... but the tapering of the drive rods really does stand out. Were those custom made? Good work! Another great model by you! Really sad to hear you're already stopping to build more of this kind! I gonna cross the borden and visit the Utrecht event. Excellent. The 3D printed parts came out very good. Brilliant train! I'd highly encourage you to build some wagons to go with the train. The details of the red frame under the boiler are incredible! Very nice bogies for the tender too! ...please don't stop to build trains! This loco is really well designed! 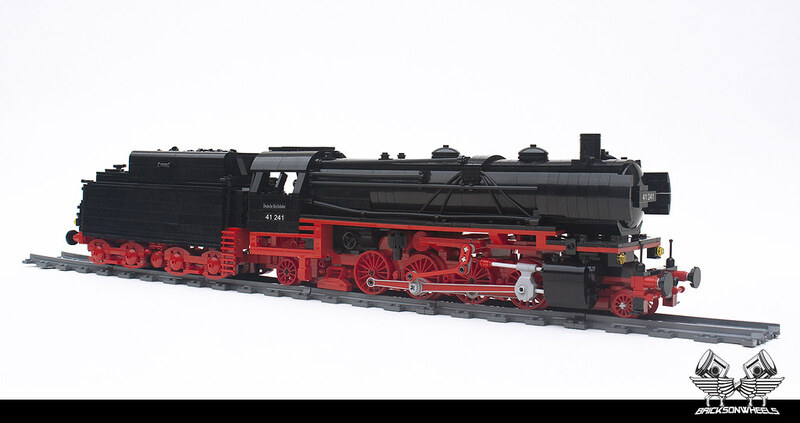 It looks really solid and well detailed, without compromising the scale/shape of the train like I've seen on other builds. 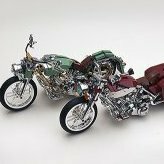 Some people get so fixated on replicating a single detail they tend to forget the rest of the model, or try and pack too much detail on there. And how'd you design the drive rods and valve gear? It looks really solid, did you make them yourself or buy them? I'd wager they're made of styrene sheeting, but I'm not sure. I am everytime surprised with the outcome of your true scaled models. Can't wait to see this beauty in real. Your questions are answered in the description. This is a fantastic build, I especially love all the details around the wheels. Are those large wheels BBB XL wheels? How did you attach the rubber band? Nice and sleek looking engine, well done! Very amazing model! I really wish I could make such detailed models like this. Truly outstanding I hope when you say your last for now you mean you will make more amazing trains in the future! Enough trains for now. If more come it will probably be an old American F type diesel. The wheels are indeed BBB XL. I cut a very small groove to position the friction rings. Truly amazing, those drive rods are a touch of magic in that red "maze of detail"! Excelent work! Thnx guys, I am glad the locomotive is so well received.